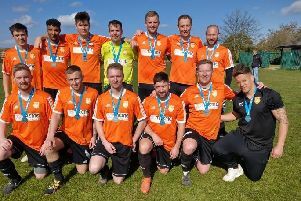 The Peterborough Football Association hosted another of their 125th anniversary celebratory matches on Sunday (February 25). The match saw a Peterborough FA Veterans XI managed by Darren Fogg take on an England Amateur Veterans XI at Stamford AFC and it resulted in a comfortable win for the local side. Darren Paling set the pace with a brace to see Peterborough go 2-0 up and centre -forward Matt Leftley added a third before half-time. The second half saw Nigel Beer score for England before Stephen Starkey converted a one-on-one with the keeper to seal a 4-1 win. Derek Gibson, the Peterborough FA 125th year organiser, thanked Stamford AFC for their support and Vivacity for the provision of momentoes. He also thanked the match officials Dave Bryan, Reg Parker, Shaun Gray and Lee Hartley. The final 125th year celebration match will be between Peterborough United Ladies and Northampton Town on a date to be arranged at the ABAX Stadium. The final event is a gala dinner at the Bull Hotel on June 1. Tickets are available from Wendy Newey on 01733 330056.